The first thing you notice when you walk backstage is how many people are hugging. The room is swarming with female activists, politicians and actresses. Most of them have never met, but they're embracing one another like old friends, displaying a level of intimacy that's rarely found among strangers in mixed company. In one corner, Jane Fonda, who is wearing an olive pantsuit with a Time's Up pin, is chatting with a pair of young organizers; Valerie Jarrett, former senior adviser to President Barack Obama, holds court down the hall. Amid the frenzy at the conference, called The United State of Women, it takes me a minute to find Aly Raisman, who is sitting in a folding chair near the back of the room, deep in conversation. She's speaking with Tiffany Thomas Lopez. Like Raisman, who barely tops 5 feet, Thomas Lopez is small and strong, radiating coiled energy. Otherwise, they're very different. Raisman, 24, has won multiple gold medals competing in two Olympics; she now lives with her parents outside Boston and flew to Los Angeles for this event. Thomas Lopez, who played softball for two years at Michigan State before leaving the program and returning home to California, is 37 and married. Their paths probably would not have crossed if they didn't share the deep, terrible bond of having been sexually abused by Larry Nassar, the former USA Gymnastics and Michigan State doctor who in January was sentenced to up to 175 years in prison for molesting hundreds of young women. Raisman, whose stick-straight posture betrays her years of training, sits with her legs crossed, eyes narrowing as she listens to Thomas Lopez recount her story. The former softball player arrived at Michigan State in 1998 and first saw Nassar that year. Raisman does the mental math about how old she was at the time, then glances at me and shakes her head. "I was 4. Jordyn [Wieber] was 3," she says later. "We never should've met him." Wieber, her teammate at the 2012 Olympics, is standing a few feet away next to Jeanette Antolin, another former elite gymnast (and fellow Nassar survivor). In a few minutes, all four women will go onstage, stand in front of about 1,000 people and talk about their abuse. For Raisman, such work -- and it is work, difficult, draining work that exhausts her physical and emotional resources -- is now routine. Over the past few months, she has traveled across the country, giving interviews and speaking at college campuses and conferences like this one. She listens and shakes hands and poses for pictures, smiling beatifically as she rips the stitches of her wounds. She recounts what happened, then tells us what she wants to happen next. While Raisman is younger than most of the event's speakers, she exudes a level of composure that can register as stoicism. When she talks, her voice is smooth and as steady as a drumbeat, building only when she wants it to. But Thomas Lopez seems anxious. She pulls out a pen and scribbles in purple ink on her notes, then shuffles the cards. Her hands are shaking. Raisman reaches out, steadying Thomas Lopez's arm, and looks squarely at her. "You're being heard now," she says. When the two women start walking toward the stage, Thomas Lopez practices one of her lines, and Raisman nods. "Do it slowly, so people can be horrified," she says. She pauses, then adds, "Because they should be." OVER THE COURSE of seven days in January, 156 women testified in a Lansing, Michigan, courtroom, telling a judge -- and, by proxy, the world -- how Nassar had abused them. Survivors like former youth gymnast Rachael Denhollander, the first woman to publicly accuse the doctor of sexual misconduct, in 2016, and Jamie Dantzscher, a gymnast on the 2000 Olympic team, spoke at Nassar's sentencing hearing about how he penetrated their bodies with his hands, using the guise of medical treatment as cover. Raisman wasn't planning on attending. But after watching Kyle Stephens, whose family was friends with Nassar, testify about how her parents didn't believe her when she told them what he had done to her when she was a child, Raisman booked a flight to Michigan the next day. Her statement began quietly. Raisman walked to the podium, smiled at the judge, spelled her name, then rocked back on her heels for a moment, steadying her face. (She often made the same expression before her floor routines, right before the music kicked in.) Her hair was pulled into a high ponytail, and she wore a hot-pink blazer that matched her blush and lipstick; the effect was one of glowing, unapologetic femininity. "Larry," she said, reading from a piece of paper, "you do realize now that we, this group of women you so heartlessly abused over such a long period of time, are now a force" -- she paused and lifted her eyes, then turned and faced Nassar, looking at him the way a person might gaze at the bottom of her shoe after realizing she had stepped on a piece of gum -- "and you are nothing." The video went viral. How could it not? Raisman was channeling an emotion that female celebrities are rarely allowed or encouraged to display: rage. Raw, unfiltered, incandescent rage, the sort of rage that's uncomfortable to look at, like pictures of a crime scene. Women were exhilarated. They shared the speech online and posted clips and painted quotes on signs, some of which Raisman saw afterward. When she realized how many women could relate to her story -- how many women understood her story because it had happened to them too -- she was moved. "It was nice," she says, before correcting herself. "Not nice -- I want to use the word 'nice' wisely, because it's horrible. But to have so much support, and to know you're not alone ..." she trails off a little. "Because sometimes, you feel alone." 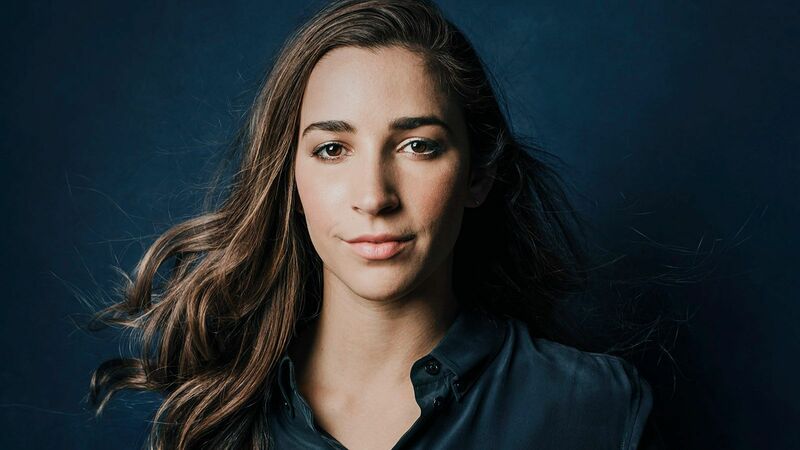 Raisman is sitting in a studio not far from her parents' house in the Boston suburbs in a robe, waiting patiently as a stylist curls her hair before a photographer takes her picture for this story. Raisman first told reporters in November that she had been abused; by then, a number of women had already come forward. But despite the enormous number of survivors -- to date, the Nassar scandal is the biggest case of sexual abuse in the history of American sports -- the story didn't attract widespread attention until the hearing this year. "There were a lot of gymnasts who had spoken up before the sentencing, but everyone kind of didn't get it," Raisman says. "I feel like the media didn't really get it either." After Lansing, people got it -- sort of. While the story finally dented the national consciousness, the complexity of the scandal made it difficult for the public to grasp in full. For many, the easiest way to reckon with such a massive catastrophe is to focus on the wickedness of the perpetrator, so that when he's finally purged from society, his ousting gives the story a natural ending -- a sense of closure for everyone who teared up at home as the survivors gave their testimonies. But that's not what Raisman wanted when she spoke in court that day. She began her statement by ethering her abuser, but she finished it by pointing a blowtorch at every institution that enabled him, including USA Gymnastics and the U.S. Olympic Committee. "I think a lot of people don't understand that this is so much bigger than Larry Nassar," she says. "He thrived for decades. If someone thrives for decades, there are people who knew about it and did nothing. There were so many people who let us down." Some of those people have been pushed out. When Steve Penny was president and CEO of USAG, the organization waited five weeks while conducting its own investigation before reporting Nassar's abuse to the FBI; he resigned in March 2017, about a month after Dantzscher, Antolin and gymnast Jessica Howard spoke about their abuse on "60 Minutes." 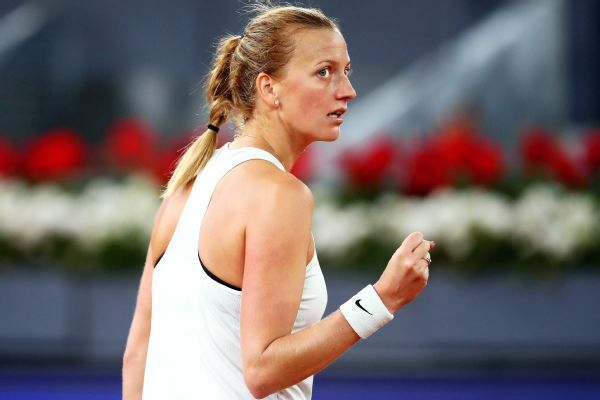 (Penny reportedly received a severance package of around $1 million.) Lou Anna K. Simon, the president of Michigan State, which agreed to pay $500 million to Nassar's victims as part of a settlement, stepped down. But there are still adults who haven't been held accountable, says Raisman, whose inclination to hold her transgressors' feet to the fire calls to mind a real-world Arya Stark. At the rescheduled U.S. Senate hearing in June, it was revealed that more than a dozen USAG staffers knew about the allegations against Nassar before USAG went to the authorities on July 27, 2015 ("which is absolutely disgusting," Raisman says). None of them alerted the police. Raisman is skeptical of the USOC-commissioned inquiry. "We need an independent investigation," she says. "If someone knew about Nassar or should have known, they need to be gone." Whenever Raisman stresses accountability, she deliberately uses those words: should have known. Nassar had countless enablers, the majority of whom probably had no idea, or didn't want to know, what he was doing behind closed doors. But their inability to notice the ways in which he groomed targets, Raisman says, is what created a preventable tragedy. In March, she launched a campaign called Flip the Switch, partnering with the nonprofit Darkness to Light to offer online courses that train adults to spot signs of sexual abuse. Raisman, who signs a certificate when someone completes a free class (1,600 and counting so far), knows many of these signals from experience. For example, she says, Nassar took "obsessive photos" of the young girls he treated, which should've concerned other adults. When the gymnasts traveled overseas for tournaments, he'd treat them at night, sometimes without supervision. "He would come into our rooms and work on us alone -- literally on top of our beds," she explains, disgust creeping into her voice. "When I look back, it's such a red flag." Raisman's first encounter with the doctor took place abroad, when she traveled to Australia to compete at the age of 15. The national team staff insisted that she allow Nassar to treat her in her room, and while the massage left her uneasy, she was too intimidated to voice her concern. "I always thought he was weird, and he annoyed me and he definitely made me uncomfortable, but I almost felt guilty -- like I was the problem," she says. It wasn't until 2015, when Penny sent an investigator to her house to interview her about Nassar (USAG was tipped off by a coach who had overheard a conversation about Nassar between gymnast Maggie Nichols and another teammate), that she realized what she had endured. "I sat up thinking about it all night," she wrote in her memoir, "Fierce," published last year. "It was like a stopper had been lifted in my mind, and the memories came flooding back clear as day: Larry. The hotel rooms. And afterward, the treats he would give us. Those little treats that planted the idea that he was looking out for us. Oh my god." After the meeting, Raisman called a USAG official and asked to speak to investigators again. A few hours later, she writes, she received a text from someone there (she doesn't reveal the texter's identity in the book) that told her to stop talking. Martha Karolyi watches over gymnasts during a training session in 2015. While Raisman is answering my questions about Nassar, the stylist finishes her hair and begins to dab her client's cheeks with powder. Raisman closes her eyelids so makeup can be applied but continues talking. When she speaks about her abuser, she rarely pauses or fights back tears; she describes him dispassionately, as though he's a stranger or a character in a book. She's aware of how unflappable she seems. "A lot of people, when they meet me, they think it's easy for me -- that I'm always that person speaking in court," she says. "But that's not how I am." She prepared to face Nassar by looking at photos of him; when he stared back at her, his eyes blank, she didn't flinch. But the confrontation left her shell-shocked. Afterward, when she and her mother, Lynn, went to lunch, she collapsed on the table at the restaurant, her head pounding with pain. As a gymnast, Raisman always projected toughness, says Madison Kocian, her teammate at the 2016 Olympics. "People thought you could put more on her because she wasn't going to break easily," she says. "There's so much emotion that she's held in." Today Raisman admits that after realizing she had been abused, she experienced PTSD-like symptoms, including paranoia and anxiety. Interviews leave her exhausted, and when she reads stories about sexual assault, she has to skip over the graphic details. While she uses a combination of therapy, acupuncture and meditation to manage her stress, the angst can be debilitating. In her lawsuit, she alludes to suffering from depression. When she speaks at colleges, men and women come up to her and share their stories of assault, sometimes for the first time. Afterward, she often wakes up in the middle of the night, restless and despondent. "A lot of people, a lot of survivors, come to me for advice on what to do," she says. "I'm very honest with them, because I'm not an authority, I'm not somebody that can hold their abuser accountable. I wish I was." Raisman is quick to assert that while she never expected to be an activist, she's grateful that people are listening -- but admits the burden weighs on her. Often, when she speaks, she'll stop and edit herself; at one point in our conversation, she grabs paper and starts furiously taking notes. She's deeply fearful of getting something wrong, of committing the rhetorical equivalent of a slip off the balance beam. "There are so many people out there that are survivors, but there are few that have a voice," she says. "I know that I'm one of the few that are being heard, so I just want to do right by people." When we're done talking, I ask if I can see her notes, and she gives them to me before she leaves. Feel pressure to help everyone, she had written, but it's so hard since I'm still processing myself. LIKE MANY ELITE gymnasts, Raisman took up the sport around the time when most kids are still learning how to walk. When she was just 18 months old, Lynn, a former high school gymnast, brought her to Mommy and Me tumbling classes at the local gym, hoping that her active child could burn off some energy on the mats. One summer evening a few years later, Lynn found a VHS tape of the 1996 Olympics and plopped 8-year-old Aly in front of the television. Raisman was thunderstruck by the Magnificent Seven, who won the first-ever women's team gold for the U.S. "The way they walked into the arena, when they're competing in their American flag leotards ... they just looked like Supergirls to me," she says. At the time, she didn't notice the person who helped Kerri Strug as she limped off the stage after landing her iconic vault on an injured ankle: Larry Nassar. In her book, Raisman describes herself as a late bloomer, noting that she had to repeat a gymnastics class because she was struggling with a roundoff back handspring. But her work ethic, she writes, never wavered. By age 10, she was practicing four hours a day after school. She skipped summer camps, dances, parties -- none of which she regrets, she says. Growing up, she loved the feeling of getting stronger, working her muscles to the point where she melted into bed at night. Kocian says Raisman was unusually driven, even for an Olympic athlete. "She would keep pushing her body until the very end, to be perfect," she says. "As a gymnast, it took a lot to break her. And that made her stronger today." At first, Lynn says, the family had no idea their daughter possessed a rare gift. "Somewhere along the way, I figured she'd probably be good enough to get, like, a college scholarship," she says, laughing. But by the time Raisman was 15, she was named to the national team, which meant she was now expected to travel regularly to Bela and Martha Karolyi's ranch in rural Texas. Bela, a famously severe coach who defected from Romania in the '80s, implemented USAG's semicentralized system; Martha took over in 2001. Under their regime, gymnasts would train in their hometowns with their local coaches, then fly every few weeks to the Karolyi Ranch, where they would spend a few days being monitored and tested. It was an experience that Raisman describes as a "fishbowl" -- sort of a cross between boot camp and "Big Brother." As a result, she says, "I felt like I sometimes did well out of fear." In "Fierce," she writes about the excruciating pressure that USAG placed on her and other elite gymnasts, describing how she hid her injuries from officials. This sense of paranoia, she says, was heightened at the Karolyi Ranch, where gymnasts were afraid to ask for water or take bathroom breaks. "You're kind of told that this is the way it has to be -- if you don't follow the rules, and you don't do what we say, then there's pressure that you're not going to make the Olympics team." For a predator like Nassar, it was the perfect hunting ground. Even though he was unlicensed in Texas, the gymnasts were forced to see him and were told that he was the best doctor available. The airless atmosphere at training camps and competitions made it easier for Nassar to groom gymnasts, since he could position himself as an ally, doling out croissants and candy and listening to their complaints. "He was our friend," Raisman explains. "He was someone that, if we were having a really hard time, he was there for us." In order to thwart the next Nassar, survivors say, the gymnastics world needs to investigate the failings of its adults -- but it must also examine why so many children were terrified of coming forward. "People don't understand ... when a kid doesn't feel comfortable immediately saying something, there's a culture that helps that thrive," says Jessica O'Beirne, a former gymnast who hosts a popular podcast called GymCastic. Gymnastics is a sport with subjective scoring; as a result, athletes are wary of rocking the boat, especially in an environment like that at the Karolyi Ranch. "They're susceptible because they will set aside their own self-preservation for success," O'Beirne says. Raisman agrees. "In gymnastics, you got a pat on the back if you were quiet and stayed in your lane -- you never really felt comfortable using your voice," she says. They rarely confided in adults. Penny was in the room when the coordinators picked the Olympic team; so was the gymnasts' athlete representative, which made them reluctant to share complaints. "Everything is a conflict of interest with USAG," Raisman says. "Everything." Today USAG, which severed ties with the Karolyi Ranch a few days before Nassar's sentencing hearing, is implementing a list of policy fixes recommended by a former federal prosecutor. All staffers must now report suspicions of abuse directly to law enforcement. The organization says it's revamping its culture. But how will the gymnastics community react if the fixes happen and success doesn't follow? The national team has won three gold medals since its inception, all during the Karolyis' reign. "I feel like, unless they duplicate the same results, people will say, 'Oh, you wanted to change everything?'" Lynn says, her voice halting. "Maybe there will be more victim shaming." Unlike her daughter, Raisman's mother can't hide her emotions; as she watches Aly tape an ESPN interview in a large, empty warehouse in Massachusetts, she wrings her hands and presses her fingertips together. Watching her, I'm reminded of the viral clip of her and Raisman's father losing their minds at the London Olympics while their daughter performed, swaying in their seats like the inflatable tube men that dance outside car lots. When Aly is finished with the interview, a few dozen gymnasts in leotards and leggings, all young girls from the Boston area, pour into the space. Some of them were invited to the shoot; others heard about it from their friends. Raisman sits on a stool, and they form a semicircle around her, sitting cross-legged on the floor. One child asks her whether she will compete in the 2020 Olympics. (Raisman is undecided.) Another girl, her hair braided into a pair of tight pigtails that swing across her back, asks Raisman how she feels before she competes. "I get really nervous," she says. "Hopefully, if you prepare yourself the right way, you're less nervous." Afterward, Raisman takes photographs with the group. Some of the girls find apple crates for the smaller gymnasts to stand on, positioning them in a way that suggests they've done this before. A pair of teenage gymnasts linger behind. Carly and Paige, both in high school, train at Brestyan's, the same gym where Raisman grew up. The two girls, who are wearing tank tops that expose their well-defined back muscles, say they cried when they watched her speak in court. "We were just as proud as when we watched her at the Olympics," Carly says. I ask them whether they've learned to spot the signs of abuse from listening to Raisman, and they nod vigorously. "You're always taught little things, but not like ... enough," Carly says, glancing at her friend. "It's never enough." Paige shakes her head. "We had no idea," she says. A FEW WEEKS later, Raisman flies to New York City for an event sponsored by the clothing line Aerie, one of her brand partners. Early in the afternoon, a few hundred people, mostly women, pack the pedestrian plaza in Times Square, sitting on rubber yoga mats in the sweltering heat. Raisman, who is wearing slip-ons and leggings with a loose T-shirt knotted around her waist, finds a spot in front. When the class ends, the crowd dissipates, then re-forms when Raisman climbs onstage. Bouncing on the balls of her feet, she tells everyone in the audience to pick a partner and list five things they like about themselves. It's a diverse group; not far from the front, an elderly woman turns and smiles broadly at a teenager, who giggles when she leans in to listen. A few minutes later, Raisman asks them to revisit what they said, substituting any of the physical attributes with personality traits. She then puts on a meditation track and sits down, pulling her knees to her chest. As she rocks back and forth a little, eyes squeezed shut, I'm struck by how vulnerable she looks. Hundreds of tourists swarm around the plaza and snap pictures as if she's a piece of public art while she meditates alone onstage. The music ends. Raisman stands up and smiles. 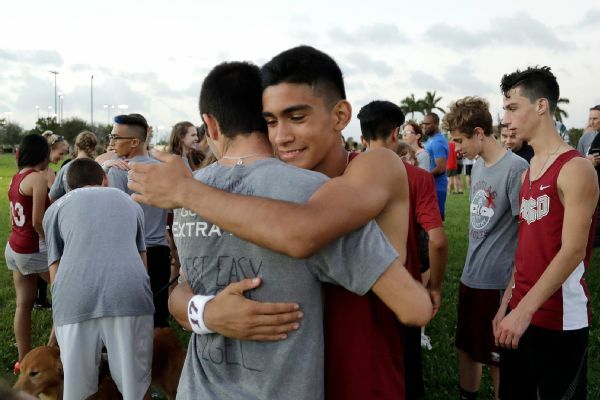 "I want you to know that no matter what you're going through, we're all human," she says. "It's OK to ask for help." Before leaving, she agrees to talk to me one more time, in the middle of Times Square. We drag a pair of metal folding chairs into the plaza and sit across from each other, ignoring the bystanders like we're actresses filming a scene. A massive billboard for Aerie hangs behind Raisman; she's modeled swimwear and underwear for the company and recently posed for the Sports Illustrated swimsuit issue. She says she's been criticized for some of these decisions, but she wants other survivors to see her embrace her sexuality on her own terms. "It doesn't matter what I went through in the past -- it's not gonna stop me, and it doesn't mean I should be any less respected just because I'm posing in a bra and underwear," she says. "Who cares?" Growing up, Raisman says, she was self-conscious about her looks. In grade school, boys used to make fun of the muscles she had spent countless hours cultivating in the gym, teasing her about taking steroids. As an elite gymnast, her body was under constant scrutiny, obsessed over by the same people who failed to protect it. In her book, she writes about how a USAG official once rebuked her for eating pizza and recounts how she was afraid that an airport security dog would smell the snacks in her luggage, tipping off the coaches to her "contraband." She has since realized that this steady drip of criticism eroded her confidence -- and, as a result, her defenses. "When you're insecure ... for me at least, it made me more vulnerable to abuse," she says. It's a problem that lacks an easy solution. An investigation could unearth USAG's secrets, exposing every adult who looked the other way. A class could teach young gymnasts how to identify the signs of grooming and abuse, empowering them to speak up if an abuser is in their midst. But when Raisman says "this is bigger than Nassar" -- a line she repeats often, because she thinks it's still not getting through -- she isn't talking about just the people who enabled him. She's talking about the forces that systematically devalue female bodies, robbing girls like her -- brave, smart, powerful girls -- of self-worth and control. "I think we have to change the way our society views women," she says. 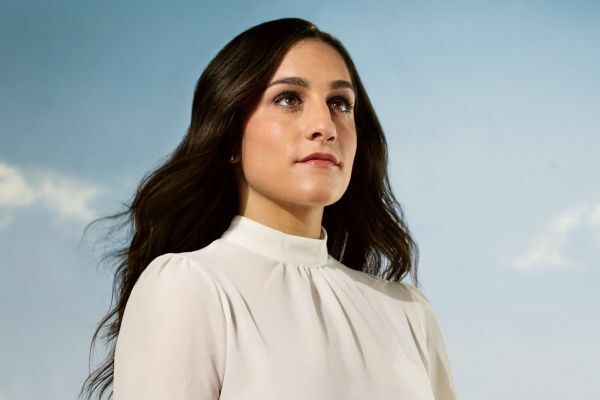 Over the past year, Raisman's work has forced her to confront not only the prevalence of abuse but also the lengths to which people will go to deny that it exists. By the time the Nassar scandal metastasized into the national conversation, the number of accusations had rendered the case unassailable: Who could disbelieve so many accusers, all of whom told the same horrible tale? But before those accusers found one another and their voices, becoming a force that was too large and credible to call into question, many did disbelieve them. Just like all of the other women asking -- begging -- us to listen when they say "Me too," the Nassar survivors were doubted for years, often by the people they trusted the most. As a result, many of them, including Raisman, learned to doubt themselves. In recent months, Raisman tells me, she's experienced more anxiety than ever. She's learning how to cope with those feelings, but some days are harder than others. She tries to find solace in small pleasures: going to Cape Cod with her family, reading Jodi Picoult novels, spending time with her dogs. Later this year, she's planning to move out and live on her own for the first time. "I've never gotten to pick out furniture, all that stuff -- I'm very excited," she says, smiling. She wants to "relax and be normal." She wants to take breaks. And yet, she knows there's a part of her that's incapable of normalcy. "Being an athlete, you're always like -- what can I do more? What can I do better?" she says. She can't help it; it's how her brain is wired. A life spent on the mats, flying and falling and flying again, created this paradox: Gymnastics hurt her deeply, but it also made her inconceivably strong. The sport gave her the tools to burn down the institution. 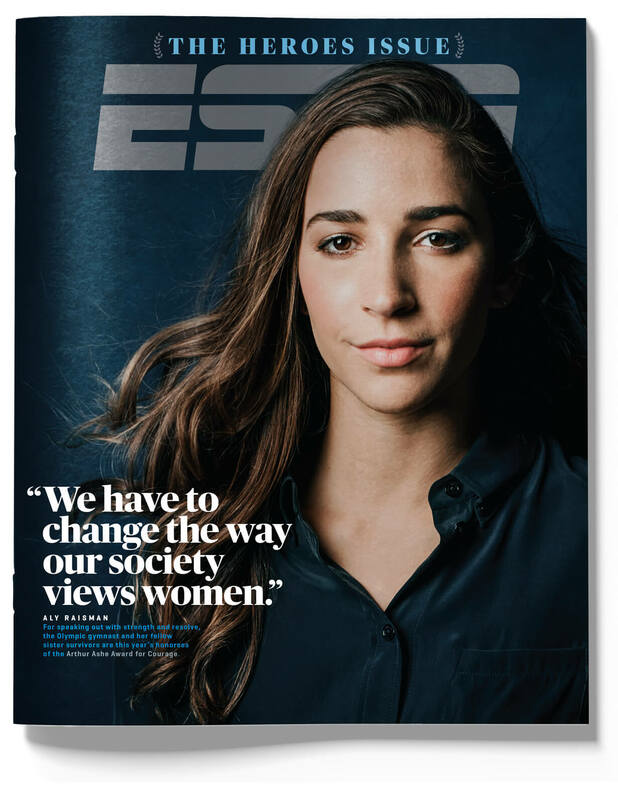 When I ask Raisman why she opted to take up the mantle of activism, she says it wasn't really a decision. "I can compare it to when I was 8 years old and I watched the 1996 Olympic team," she tells me. "I thought: 'I'm gonna do that, and I'm gonna be there.'" As always, her tone is disarmingly matter-of-fact, as though she's reciting an obvious truth instead of describing something that many would characterize as an impossible dream. "I felt when I was younger that I was going to go to the Olympics," she says. "And now I feel that I'm going to help fix this." Mina Kimes is a senior writer for ESPN.